Melanie is taking Sky home (she was asleep when Kerry and Joe picked up the other kids last night). She is still upset. Joe apologises to Melanie again. MELANIE: That's OK, I can take a joke, I'm just used to people with a more mature sense of humour! Melanie quietly passes Toby the joke tape that they made and he quickly puts it in the answerphone. Christina is wondering what she could do today - she's so bored and has cabin fever. Caroline tells her that they can't afford to draw any more attention to themselves - Christina absolutely can't go out. Caroline is off to work. Lochy begs Toby to lend here $4, but he says he needs all his money for something else this week. Caroline is telling Paul that they have to upgrade the conference rooms to keep up-to-date - the convention circuit is very competitive. Melanie tells Paul quietly that he shouldn't socialise with Linda after hours as she has "reputation". Paul tells Melanie off for keeping the rumour going. Christina is going out dressed in a hat and dark glasses(!) 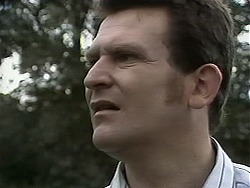 Joe races over to apologise for the business with the police. She tries to walk off but Joe keeps rabbiting on. 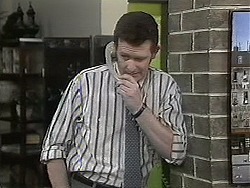 Toby tells Lochy that he has to go and run a private errand. She is cross that he is keeping secrets from her. When Toby heads off, she follows him. Caroline is telling Paul that they should consider some acoustic tiles for the ceiling of the convention room. She tells Paul that she finds the job much easier now that Paul knows her situation - she can concentrate properly. Paul doesn't know how the twins have coped. Caroline is more worried about Christina. Joe comes in and is stunned to see "Linda" there. He can't understand how she got there so quickly. Melanie is telling Bronwyn about the joke Joe played on her. She's extremely disappointed and now she feels like her future is gloomy. Bronwyn reckons there's someone out there for Melanie, she should just stop looking so hard. She reckons Melanie should be patient, but Melanie says that even Hilary has a boyfriend! MELANIE: If there is someone out there for me, I just wish that I knew he existed. I just need some kind of sign. 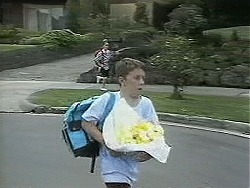 Toby has arrived home after his errand and puts some flowers on the doorstep of No.28. Lochy goes up and reads the card. It says, "I Love You". When Melanie comes along, she bribes Melanie for $2 and then tells her it was Toby who left them. Des arrives home and finds the phone ringing. He answers it. 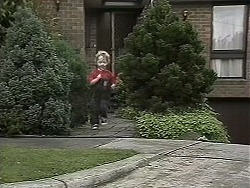 While he's on the phone, Jamie escapes out of the front door and on to Ramsay Street. Melanie comes round with some chocolates for Toby to say thank you for the flowers. He said he left them to cheer Melanie up and reckons that lots of people love Melanie. Toby is not impressed that Lochy followed him and starts tickling her! Melanie tells Joe that she got some flowers from her secret admirer - she met him and he's gorgeous! MELANIE: By the way, you've got a really great kid there. JOE: Tell me about it! Bronwyn is just heading over to Des's. Melanie is worried about Des's new job, he doesn't have much time to play with Jamie. Des gets off the phone and goes off for a shower. Bronwyn can't find Jamie and starts to worry. They check the cupboards but then realise that he's escaped out of the front door. He runs out to look. DES: JAMIE! JAMIE! How could I be so stupid! Des has been on the phone for twenty mintues - Jamie could be anywhere.